I sleep cold. I have always needed sleeping bags rated at least 15 degrees colder than the conditions I expect. Once I made that adjustment, I have logged a lot nights in a variety of bags with a variety of fills. My current approach focuses on staying just as warm while carrying less weight. 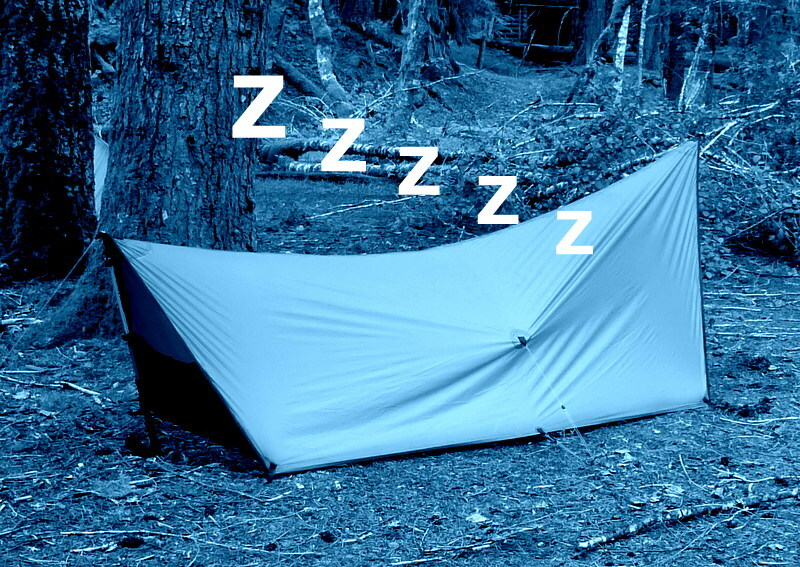 Sleeping equipment is one of the “big three” in moving to lightweight backpacking. So I looked for a lighter solution, and decided to try a quilt. While I have had down bags, synthetic fill is my choice in the rainy Pacific Northwest. While you can usually keep a bag from getting wet, during extended wet weather, bags do get moist. Synthetic bags seem to deal with this better than down. I have no experience with the new “water repellant” down. Recently my bag has been a Mountain Hardware Lamina 15. It has a good synthetic fill and packs well. I like the design, especially the draft collar works for really cold nights. It weighs 3 lbs. 12 oz. Backpacking quilts are like a sleeping bag with the zipper almost completely open. They cover you with your feet going into an end pocket. Unlike an open sleeping bag, they don’t have a thicker top and thinner bottom and so are uniformly thick and warm. 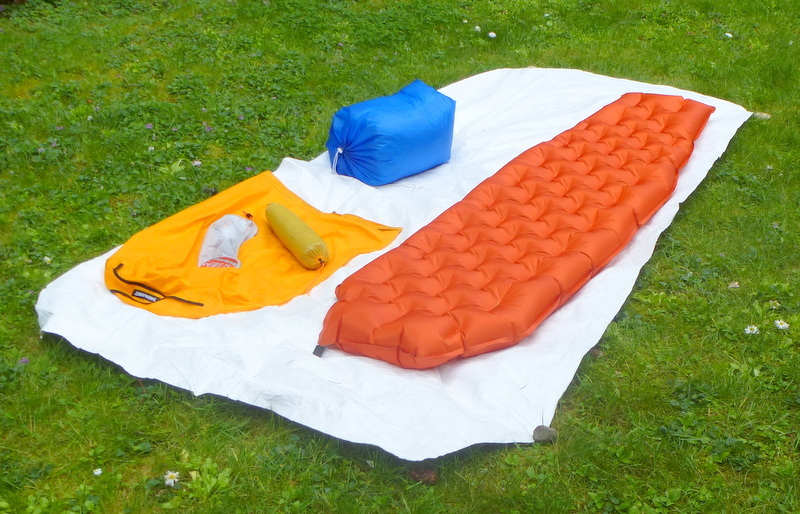 Many cottage ultralight suppliers offer them, but I chose a weight and money saving approach and built a Ray-Way quilt kit with Alpine Insulation, rated to 28 degrees. As built with stuff sack, it weighs 1 lb. 12 oz., less than half my old bag. It’s about as warm as the Mountain Hardware bag it replaced. Sleeping with a quilt is different in a number of ways. The quilt just rests on top so if you are cold and put on more clothes, it doesn’t constrict as a regular bag will do. When you turn in the night, and I do, it doesn’t wrap up or twist. However, it will leak cold air around the edges and you can toss it off. I added a bottom strap at about stomach level to pass under my sleeping pad and help keep the quilt in place. Some commercial quilts actually have an envelope to hold your sleeping pad. Nights under the quilt have been comfortable and 2 pounds is a fairly major saving. I have slept on everything from open cell foam, to ensolite, to blue foam, to self-inflating pads. I bought an insulation filled air mattresses a few years ago and liked the comfort it provided. 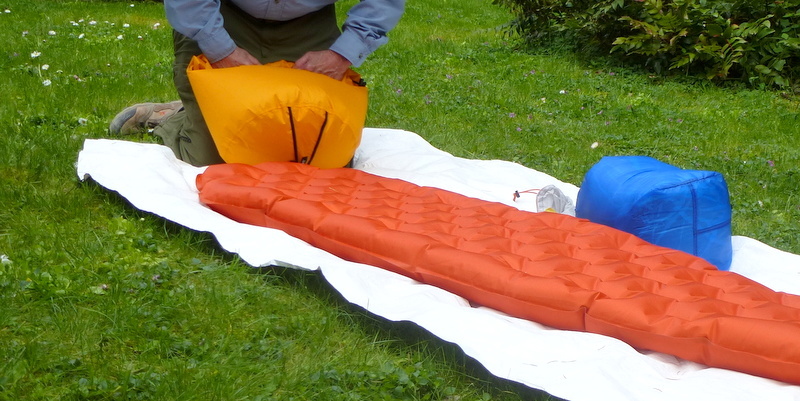 The extra thickness lets you be less fussy about tent location and the mattress accommodates small lumps and rocks. After some years this Big Agnes air mattress started leaking and I replaced it with a now discontinued Big Agnes Q-core SL mummy pad. Full length pads keep my feet from getting cold, but I am happy with tapered mummy shape pads. Remember with a quilt, your sleeping pad is the only thing between you and the cold ground. I inflated my old air mattress by mouth. It didn’t take that long, and I didn’t carry any extra pumping equipment. But I worried about moisture condensation in the insulation. 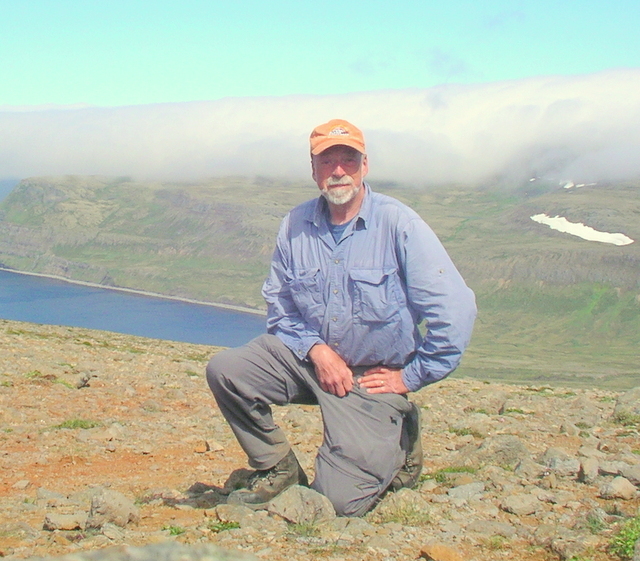 When I replaced the pad, I decided to try some else – a Therm-a-Rest NeoAir pump sack. This 40 liter stuff sack has an elastic plastic insert in the bottom with a hole that stretches over the open mattress valve. You open the sack, fold over the opening quickly and force the trapped air into the mattress. I need between 3 and 5 repetitions to get the mattress full. Then I top it off my mouth. The pump sack is useful as well as a auxiliary sack when I am in the woods. This pad and pump sack weigh 1lb. 6 oz. I was also intrigued by the Therm-a-Rest NeoAir Mini pump. At 2.3 oz. it is lighter than the 3.2 oz. pump sack. However, it whines and you need to manage batteries over an extended trip. It also will not double as a stuff sack. All this by no means results in the lightest approach a sleeping pad, but mine is 3-1/2” thick and warm and remember I have opted for a “comfort light” approach. Some folks use extra clothes in a stuff sack for a pillow. I like a pillow, but I try not to bring a lot of extra clothes. So if is cold or wet, I can’t count on leftovers for stuffing. On a ultra-light cottage website, I found some inexpensive inflatable pillows, made for airline use. They inflate by inserting a plastic straw into an opening. When the straw is removed, the opening seals. Deflation is done by putting the straw back in. But they are not very comfortable “naked”. After I made my quilt, I took some leftover batting and made a case for the air pillow with batting on one side. I made a sausage shaped stuff sack that fits the rolled up pillow and sleeve and straw. Once I get the inflation pressure right, it works great, weighs 2.6 oz., and packs small. This entry was posted in MYOG, Sleeping and tagged Big Agnes, NeoAir pump sack, quilt, Ray Jardine. Bookmark the permalink.